So immediately we have b = 33 and d = 25. Now we just scan a table of Pythagorean triples for ones with 56 as one leg and a as the other, where a+33 is the hypotenuse of a Pythagorean triple which has 60 as a leg. We find 56, 42, 70; 42+33 = 75 is the hypotenuse of the triple 45, 60, 75. So the triangle’s other two sides (in cm) are 7.0 and 7.5. Is that all there is to it? Seems too easy. Surprisingly easy for a Susan Denham puzzle. 5 across must be divisible by 5 so must end with either 0 or 5. If our even digit is 0 then one of 4 across and 5 across must be 00, which is presumably disallowed implicitly — otherwise there would be multiple trivial solutions of the puzzle, e.g. 50 at 5 across and zeros everywhere else. Assuming all the numbers have to be nonzero, 5 across must end in 5 and the odd digit is 5. For 6 down, the only 2-digit multiple of 6 containing a 5 is 54, so our even digit is 4 and 5 across is 45. Excluding any more 5s from the third and fifth columns and third and fourth rows, 2 down is 44, as is 4 across, and 3 down is 44544. 7 across can only be 54444 or 45444 or 44454, but only the second of these is a multiple of 7. Likewise 1 down can only be 45444. The second digit of 1 across must be 4, and for divisibility by 3 the fourth digit must be 5. Easier than it looks at first. Consider at first the three lines that cross at a point. On their own they create 6 edge regions and 0 non-edge regions. Call these lines 1 through 3.
with the result n = 15. Do not expect a diagram of this. There are several possibilities to consider. The single digit number could be the first in the sequence. Then it must be triangular: 1, 3, or 6. The second number must be two digits, with no zero, which when added to the first must be triangular, and the between the two numbers there must be no repeated digits. The single digit number could be the second in the sequence. Then the first must be triangular, with a single digit difference between it and another triangular number; it can only be 10, 15, 21, 28, or 36. But 10 is ruled out because it has a zero, and 28 is ruled out because the corresponding single digit number, 8, shares a digit with it. Could the single digit number be the third in the sequence? Then the first two numbers must add to 10, 15, 21, 28, or 36. They must have two digits each, which is impossible for 10 and 15, and they must not have the same first digit, which is impossible for 21 and 28. The first must be triangular, so all we’re left with is 21+15=36 (in either order), but those share a digit. So no, the single digit number cannot be third. Nor can it be fourth or fifth. For each first two numbers we consider which 2-digit numbers can be added to bring the sum up to another triangular number, and we rule out ones that repeat digits with themselves or the first two numbers, or which share a common factor with the first 2-digit number. The possibilities are shown in the fourth column. 6, 49, 23, 58 and then 17 will give a triangular number. No common factors. The only solution is 6, 49, 23, 58, 17 with sums 6, 55, 78, 136, 153. The number which is both a square and a cube must be a sixth power: 26 = 82 = 43 = 64, or 36 = 272 = 93 = 729. Note that the only cubes with 2 or 3 digits are 27, 64, 125, 216, 343, 512, and 729. Try 64 at 6 down. Then 6 across must be a square: 625 or 676. If 625 then 5 down has middle digit 5 which means it’s 256. Then 7 across can only be 64, which duplicates. If 6 across is 676 then there is no possibility for 2 down. So 6 down is not 64. Try 64 at 3 down. Then 4 across is 144, 324, 484, or 784. If 144 then 2 down must be 216 or 512. The former leaves nothing for 1 across; the latter forces 1 across to be 25. 5 down must be 441 or 484 (400 is ruled out because we don’t allow a leading zero for 7 across), but no 3-digit cube ends with 8 so it’d have to be 441. Then 7 across must be 16, 6 across is 324, and 6 down is 36. If 4 across is 324 the middle digit of 2 down is 3, but there are no 3-digit squares or cubes with 3 as the middle digit. If 4 across is 484 or 784 then 5 down is 841 and 7 across is 16. In the 484 case 2 down must be 144 or 441 or 841, none of which leaves anything for 6 across. In the 784 case 2 down must be 576 or 676 either of which leaves nothing for 6 across. The other possibilities are 729 at 2 down or 5 down. 5 down doesn’t work because it leaves nothing for 7 across. With 729 at 2 down, 6 across can only be 196, with 6 down being 16. Then 5 down must be 169, 361, or 961. The first leaves nothing for 7 across while the latter two leave only 16, which duplicates. I can’t see an easy way to do this by hand, but it can be done in a spreadsheet; the key is to figure out the needed formula. where ⌈x⌉and ⌊x⌋are respectively the ceiling and floor functions. Multiply that by 4 and sum over all x from 0 to r–1 and you have the number of cells crossed. 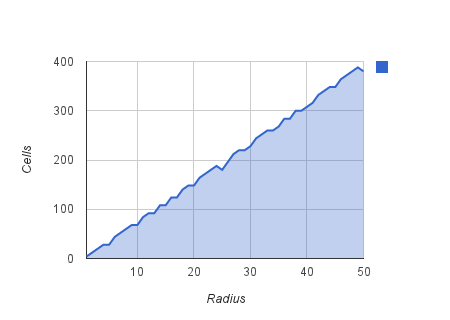 For a radius of less than 50, the only place the number of cells decreases when the radius increases is in going from radius 24 (188 cells) to 25 (180 cells).